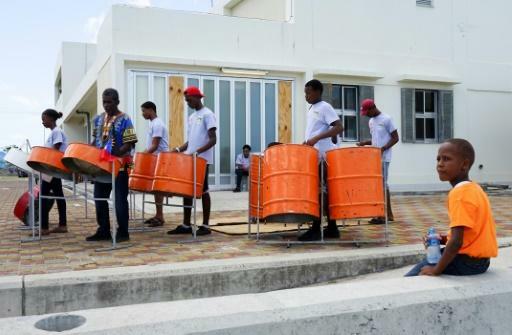 Steel drums carry a jubilant rendition of "Guantanamera" over the ruins of Barbuda's capital Codrington, as dignitaries and residents mark the latest bit of progress in the island's grueling struggle to recover from Hurricane Irma. The event celebrated a Chinese-funded program to replace roofs ripped from more than 300 homes by the powerful storm that damaged or destroyed nearly every building on the tiny island when it roared through on September 6 last year. The project has enabled hundreds of families to return home from sister island Antigua as Barbuda continues the daunting process of rebuilding the 62 square mile (160 square kilometer) isle, where a scant five percent of homes escaped damage. But it has also burnished the image of China at a time when some in the region, including the tiny archipelago's prime minister, complain that US and European aid have fallen short. The $2 million repair project marks a "new model of assistance" from the Chinese government, said Ambassador Wang Xianmin. 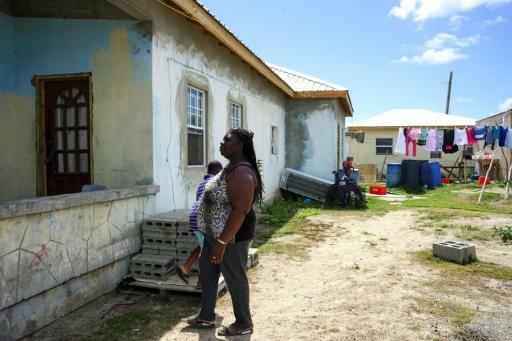 The challenge of rebuilding after Irma has been enormous: an estimated 60 percent of Barbudans were left homeless; the island's electrical system was devastated; potable water was scarce. While the Chinese contribution was a relative drop in the ocean compared to the estimated $220 million needed, locals say they at least followed through, while other promises of aid have proved frustratingly elusive. Edith Griffin had spent nine months living in a tent with her family by the time her Codrington home was finally repaired last week. "It's so comfortable to be back home," she told AFP. William Beazer was similarly relieved to have the tarp covering his shattered house replaced with sturdy new galvanized steel. Bit by bit, life has edged closer to normal. As families start returning, the island's children inject a buzz into the air. A primary school still awaits repairs, medical services have yet to be fully restored, and debris still lines the streets -- a painful reminder of the low-lying island's continued vulnerability as peak hurricane season approaches. "The problem is, there's nowhere to put it," one man said of the omnipresent debris. But there have been tangible improvements even in the space of a few weeks, said Kerrie Hall, a spokeswoman for the United Nations Development Program (UNDP), which oversaw the roof restorations. "The clean-up crews have made a huge difference," Hall said. "What's wonderful, too, is that the mood has lifted here; everyone is so much happier." Exceeding the target of repairing 250 homes in five months was no easy task, said UNDP project manager Paola Solda. "It was extremely difficult to coordinate the movement of materials to Antigua and then on to Barbuda. Very rough seas meant we often had to postpone supplies, and electricity and water still pose challenges," she said. One young mother, Avelyn Thomas, now has a new roof over her home but still no windows. Given the pervasive mosquitoes, she and her two sons, aged seven and 10, are sleeping at her mother's house for now. Even so, after months in an Antigua shelter, Thomas said they are "loving" being back in familiar environs. Barbuda Council chairman Wayde Burton said residents are "very thankful" for the roofs, installed by 20 local contractors. But he also highlighted how much remains to be done, saying the hospital and police station are still not fixed, and emergency hurricane shelters are not ready -- which the island's government denies. Gaston Browne, prime minister of Antigua and Barbuda, acknowledged the "extremely daunting" task of rebuilding. When the government pleaded for help in Irma's immediate aftermath, Browne said "China was among the first to respond." For years, China has been expanding its presence in the Caribbean, providing loans, donations or investment to build roads, port facilities, government buildings and even stadiums. Analysts say when US private investment in the area waned after the financial crisis of 2008, Chinese investment surged. 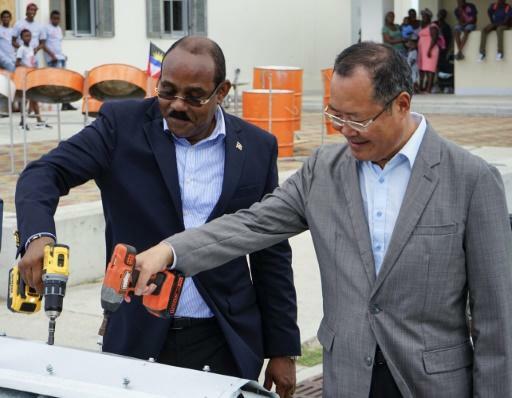 Last month, Antigua and Barbuda became the first country in the eastern Caribbean to sign a memorandum of agreement to work with China's ambitious "Belt and Road Initiative," establishing closer trade and diplomatic ties. Beijing is "filling the void" left by the US, Browne said. "They treat us with benign neglect," the prime minister said of American officials. "I guarantee the US did not give us $100,000 after Irma." A fact sheet provided by USAID said the United States had provided $800,000 for "interventions in Antigua and Barbuda and Dominica" as part of $21.6 million spent on regional hurricane recovery. It did not provide a breakdown for Barbuda. Other pledges of help, said Browne, included five million euros ($5.8 million) from Europe and three million pounds ($4 million) from Britain. "We have not been able to avail ourselves of those funds, and it's not for lack of trying," he said. "Venezuela, despite its problems, gave us $3 million, and Cuba, one of the poorest countries, gave us rice and sugar and sent a vessel here." But 10 months after Hurricane Irma laid the island to waste, Barbuda's weary residents seem unconcerned about who precisely paid to fix their roofs. They are just happy to be home.